So, after lots of requests from the internet and my friends, I thought I'd upload a step-by-step guide to making a rose out of sheet copper and steel/brass rod. Of course, this is not a definitive guide - I saw a similar flower on the internet and wasn't completely satisfied with it, so modified it to suit what I wanted in a project. So feel free to adapt and change as you go along; as long as you don't just steal my idea and call it your own, I'm fine with it. A big, big thank you to everyone who did vote for this in the Valentines 2013 Contest - I won! Thank you so much, it was an incredible surprise. Also, a big thank you to my very tolerant parents, my helpful DT teacher, and Jeffery Santo at Darkmoon Metals, who gave the initial inspiration for this project. Few words before I begin (skip ahead if you want, nothing here's essential): This is my first attempt, ever, at making a guide to a metalworking project (or actually to a project of any sort) - whilst I have guided friends through making things in person, I've never tried to communicate steps just via words and pictures. So this is a new type of challenge for me, and the outcome may not be perfect. That said, I know that I may make steps too complex/it's fairly easy to be misunderstood, so if you do want clarity on a particular step, just comment and I'll do my best to fill you in. This is a fairly simple metalworking project, as there is no welding of any kind involved, which can sometimes dissuade beginners. Secondly, I am assuming a variety of things, such as workshop ability. I am 17, have done a Design and Technology (Resistant Materials) GCSE (woo A*) for which I was awarded an engineering scholarship, spent many, many hours doing metal and woodwork both in and out of school and in general love working with my hands. It's therefore safe to say that what I may find simple (texturing, peening) may be a complex process to many of you, so I have tried to make this project as simple as possible, whilst still producing a satisfying end result that looks, and feels, professional. I have kept all the stages exactly the same as the first time I made one, so I haven't dumbed it down at all, but want to warn you - this is not something that can be done without commitment to the project. It really is worth it though. Thirdly, and most importantly, be safe. Whilst this is not a particularly dangerous or complex project, it does involve working with tools and temperatures that can give you nasty burns/cuts/trips to hospital - I should know, I've cut myself (not badly) several times on multiple projects. So just play safe - don't rush, and plan out what you are going to do. I'm lucky in that I have parents who are really happy that I have a hobby on the side, and are cool with me using propane torches etc. as long as I am safe and responsible- yours may not be, so check it out with them beforehand. Who knows? Your dad might rediscover a hidden passion for metalwork - but just ask. If you're lucky enough to have a workshop, great - I don't, but I did use money from the scholarship to buy a workbench for my room, giving me a safe worktop to use. In essence, don't do anything you'll regret later. With that out of the way, we can move on. Step 1: Go Forth and Gather! Scribe & Centre punch- I actually made myself a set from some old, thick nails, but I also use some I found in my toolbox. Cordless Drill/Drill Press/Dremel/Hand Drill - as long as it can take a 5mm (3/16" or thereabouts) drill bit, you're good. Drill Bits: 5mm ​(3/16")/3mm ​(7/64")- for use with above. Other sizes are always handy. Tinsnips/jewellers saw/pneumatic press - essentially, something to cut your copper with. I found these to be excellent, but use whatever suits you the best. Metalworking file - for removing rough edges and cut marks. Dirt cheap, and ubiquitous at DIY stores. Cross Peen hammer - you know the end of the hammer head you always thought was for use with tacks? Well, it's not. Propane Torch/forge/brazing hearth- a heat source, capable of annealing copper. You can get away with using a cooks blowtorch or a gas hob, but I invested in this as I do lots of metalwork at home. Pliers (Needlenose, locking, rounded) - for manipulating the metal. I daresay you have at least needlenose pliers lying around, and you can manage with just them. M6/M5 dies (optional) - for cutting the thread. I don't own a set of taps and dies, but I'm going to buy one. I used the ones my school workshop has, but if you can't get your hands on some, I'm providing a workaround as they are slightly obscure. A full set will cost a bit, but they don't wear out quickly, and are very useful. Cutting fluid(optional) - this helps to make a nice, clean thread as well as prolonging the life of your tools. Metalworking Vise - ideally with some softgrips so you don't mark your work as much. Ballpeen Hammer - with a rounded head to make rivets. Wire Brush - one with a toothbrush sized head works best. Right! Now that you've worked your way through that rather long list of tools, we can move on to the materials you'll need. 50x225mm of 1.2mm/16oz Copper Sheet - if you can't get hold of this locally, there are plenty of suppliers online - this is what I use, and it is enough for two flowers with spare. Alternatively, reclaim some copper by opening out some old copper tubing and flattening that out. 2x Steel M6 hex nuts - very common, and very cheap. Keep a couple spare, in case something goes wrong. 200mm of 6mm/ 3/16" silver steel rod - you can use mild steel rod (cheaper, and more common) but silver steel is harder; whilst this makes it more difficult to work (cutting threads takes longer) it also means that the thread is much neater and better for what you're gonna use it for. Now that i've made lots of roses, I recommend using smaller diameter steel as it looks more aesthetically pleasing. However, the pictures in the guide are old, and still using those old photos. Use 4mm steel and an M4 die if you want to go for something prettier and only slightly less strong. Brazing rod/brass rod of a smaller diameter, around 4mm - this is for the workaround step. Brass is one of the few metals that's really soft enough to be cut without using a die (but more about that later). You can find this in most hardware/ironmongery type places, or online. I happen to have the last three things lying around at home or in my school workshop, so I didn't put links as to where I got them from - if you do happen to fund a good source for some, just put it in the comments and I'll add it in. Finally, we can begin work. Ok, so you've gathered your equipment, and bought/salvaged your materials. Now, turn on some of your favourite music, grab a drink, and get to work on this first stage. Take your copper sheet. Remove any protective plastic so that you are faced with a clean sheet, and mark one edge every 50mm (~2"). Repeat on the other side. Using your scribe and a ruler, draw lines across the width of your copper to divide it up into four 50x50mm squares, with one 25x50mm rectangle left over. In the photos, I'm going to be making two roses (to demonstrate the normal method, and the workaround method) so don't worry if what you're doing doesn't match up exactly - though everything should be obvious enough. In order to find the centre of each piece, join the corners up with a ruler and, using a centrepunch and hammer, mark where the lines join. These dents allow us to drill the holes we need without the drill bit slipping too much. Then, using your 5mm (3/16") drill bit (3mm (7/64") if you're using brazing rod, as that's roughly how thick it is) drill holes in the centre of all of your pieces. I tend to use my 2.5mm bit to drill pilot holes first, as I don't want to wear out my 5mm bit too quickly, but it's up to you. Go slowly, and make sure your work is firmly clamped to a piece of wood to stop the copper bending. I improvise a good clamp by using some cheap g-clamps and my 'anvil', and that helps to secure the metal without leaving marks. File off any rough edges from the drilling. Using your tinsnips/preferred method of cutting, cut out all the pieces, so you end up with four 50mm squares, and one 50x25mm rectangle. Using a file, remove any sharp edges/cut marks, and you should be left with your copper blanks ('petals'), each with a hole in the centre. Check that your rod ('stem') fits cleanly through. Remove the corners that you have now exposed, to create four individual petals. File all those new cut edges to remove any toolmarks. Then, use your soft mallet to hammer the copper flat. It doesn't matter if the petals overlap slightly, we'll sort that out later. For the rectangular blank, make a tiny cut from the centre of the long edge towards the hole, giving the same 5mm clearance around the hole. Then, remove the corners you've created to make two triangle shaped cuts. Again, file the cut edges and hammer flat. Grab your crosspeen hammer, and turn it over so you're using the flat (regular) side. Using firm, regular strikes, hammer the edges of each petal thin, on both sides - you want to make them so that they can be easily curled at the edges. It doesn't matter that much if you mark the copper, as we're just about to start texturing it. Only do this for one side of each blank -there's not much point in doing it to both sides, and by trying to do it to both, you'll end up flattening out the other side. Undoubtably, your petals will now be slightly overlapping due to the copper being spread out slightly over those cuts you made. This will prevent us from shaping them easily, so we want to remove that overlap - simply use your tinsnips to make those cuts again, in the same places, and the overlap will drop off and the petals should be nicely separate. Quick word about copper, and work hardening. Copper is one of a few metals that the more you work, the harder they become, and the more brittle they are. This isn't great for us, as we want to bend all the petals and shape them a lot, without them breaking. Fortunately, copper is very easy to get back to its malleable, soft, state via a process known as annealing. To do this, heat your copper with your torch/furnace until it is an even cherry/brick red, noticing the amazing colour changes that occur along the way. If you've never done this before, do it in the dark so you can easily tell when it changes colour. It's quite tricky to melt copper by accident - just don't heat it unevenly, or leave it in the forge too long, and you'll be fine. Maintain that colour for a couple of seconds, and then either leave it to cool or immerse it in cold water - surprisingly, quenching it like this actually makes it easier to clean as lots of the oxide flakes off in the water. The more times you do this, the easier it is to judge when the colour is just right and how long it takes to heat it to that state - practice, and you'll be doing it in no time! Clean your copper up with a wire brush and some sandpaper (I go all out and use my burnishing wheel, even though it makes the shaping trickier) and set it to one side. This is the last time you can clean/polish up the middle parts of the petals, so take the time to get them looking nice. Alternatively, you can leave them in their oxidised, reddy/brown state - that looks nice too. That's the petals done, so begin work on the stem. Taking your length of steel, grind a slight bevel on end end using a file or an electric grindstone, should you have one. This is to get the die to grip the steel and makes it easier to start cutting the thread. Take your M6 die liberally paint the inside of it with cutting compound. This makes life a lot easier. Secure your length of rod in some softgrips in a vise, and start to cut your thread. If this is your first time, I cannot recommend more practicing this over and over again - it must have taken me 4 goes to learn exactly how to cut threads, and a bad thread cannot really be salvaged. I recommend going one turn clockwise, then half a turn back, then one turn forwards, then half a turn back etc, as this help keep the thread neat. If you're using silver steel, this can be quite tough work, so take breaks and go carefully. You want to end up with about 50mm (2") of thread on the end of your stem. Take one of your hex nuts and screw it on to the thread you just made, until it reaches the bottom. Make sure to tighten it as much as possible (I use my locking pliers to get a really good grip) - you want to get a nice, secure platform for those petals to sit on. If you wanted, you could run some JB Weld (or any other liquid weld) into the threads on the nut beforehand, so that it glues in place , but I never bother. Now, skip ahead to step 8. So for those of you unable to get your hands on a set of dies, we're going to improvise. The aim of this is to cut a thread using your hex nut (steel) on the softer stem (brass). I'm assuming you use brass rod of roughly 3-4mm, and a hex nut that's a size too small. Take your brazing/brass rod and file/grind a point on one end, to allow the nut to slip on easily to get it started. I actually put some cutting compound on the inside of the nut, just to see if it would improve it's cutting ability, and it seemed to improve how well this worked. Then, using either a spanner (tough) or a socket wrench attachment for an electric drill (easy), tighten the nut onto the rod whilst steadily applying downward pressure. It'll be very hard going by hand, so I highly recommend the latter method. Eventually, you'll notice that the nut is beginning to cut a thread - continue until you have ~30mm (1") of thread on the rod. I actually remove the nut at this point and replace it with a fresh one, but you can leave the original one on. You're done! Whilst this will (and does) work, it doesn't give a high enough quality product for me, as the thread you cut is very rough and weak. You could use JB Weld to affix the nut, or solder (silver solder) it in place for a stronger join. This is very important - if you don't do this right, you won't be able shape the rose later. Take the next square, and align it with the first. Then, align the fourth with the second. Finally, simple thread the rectangle on top - it doesn't really matter about alignment, though I make it in line with the third out of habit. To finish off, thread your second hex nut on top and tighten it down so that the petals begin to buckle slightly and the nut is very tight. Don't tighten too much, as you could damage the copper. Make sure to keep all the petals in their correct alignments -after the next step, you can't change where they are. So, I'm gonna assume that you've now got roughly 20mm/ 1" of threaded stem left on top of your last nut. Using a hacksaw or a file, trim this down to about 4mm/0.25", and clamp your flower securely in some softgrips. Now, take your ballpeen hammer, and begin forming a rivet. Once you have done this, you cannot change the arrangement of the petals. To do this, forcefully strike the edges of the stump of thread, using a regular vertical hammering motion, until it starts to mushroom and form a rounded half-sphere. Continue striking until the bottom edge of this rivet is flush with the top of the nut, locking the nut in place. Awesome! So close to finishing, it's unreal. So, pick up your round pliers (so you don't leave grip marks) and get to work. 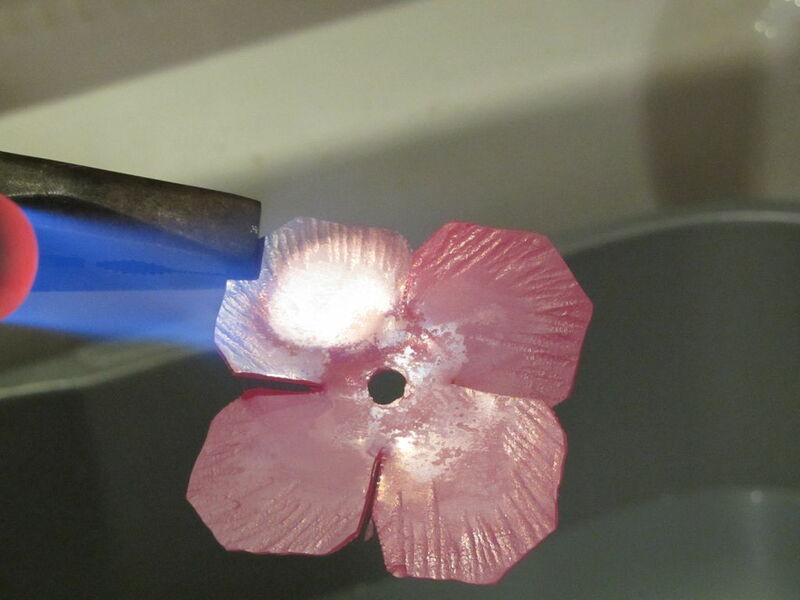 Begin by taking your rectangle and folding one of the petals up and around the rivet. It can be very useful to start at the part of the petal that is closest to the stem, and work outwards - that applies for all this shaping. If at any point the metal becomes unworkable, stop - you can't force it. Simply anneal that section of the copper (by tactical application of a blowtorch, for example) and keep going. You really don't want to break one petal now. Repeat with the other petal of the rectangle, but form it around the first petal to form a 'bud'. Now, use your pliers to bend up, shape and curve the next 16 petals to your liking - I can't really be much help here, as it's all down to what your idea of a rose is. However, I can tell you what I do. I normally bend and curve the first 8 (top two layers of squares) quite severely upwards and inwards, to form a larger bud. I then steadily reduce the angle of the bends for the next two layers, to make it so the bud is opening out. Finally, curl the tops of your petals outwards to expose the texturing you worked on, and crinkle the edges - this step really makes a huge difference. And that's it! Apart from some cleaning and finishing, you're all done! Congrats! To clean up any oxidation from annealing, use a wire brush followed by sandpaper - wire wool also works well to get into all the nooks and crannies you've now made. Either burnish the steel/brass with sandpaper to get it to gleam, or leave it dull - both look nice, and complement/offset the rose. At long last, you can apply a spray of clear coating (I hate the stuff, so don't bother - it will make the colour last, but adds an unnatural gleam). Phew. Take a step back, breathe in, and admire your creation. Now you're done with that, how about some modifications! These are just a few of the ideas floating around in my head, and if I get around to making any I'll upload them here. - I'm sure you've got some too, and if in doubt just look to nature! This is aw inspiring. I make tree's and ring's out of copper, but been looking for something new. quick note, what if you zinc plated parts of in like one or two of the peddles? Thanks! I'd love to see some photos of copper trees - they sound cool! There's no reason why you couldn't zinc plate some of the petals, apart from it being a bit harder to shape them later without cracking the layer - it would be easier (and this is what I'm testing out at the moment) to just brush some of the petals with gold/silver gouache or transfer on some gold leaf, if you wanted some colour variety. Another way that you could get some color variety, which I'm going to test when I get the chance to start working on my rose, is to collect some copper wire to form a stem and then oxidizing it. Suddenly, you have a pretty natural looking stem to go along with your copper flower, and when it's all varnished, the color difference is preserved! Also, this is an amazing instructable. The extra detail you put into it, especially the texture of the individual petals, makes for a product that really stands out. Great job! Wow, really fancy! :) Great pattern...makes it look totally do-able yet professional! Cheers! Glad you liked them. Out of interest, do you know if there is a place on the forums where you can chat about pricing of things? It's just that i've now received several commissions (woo!) for some of these, and would love to get a sort of crowd sample to see how much people think I should sell them for, without resorting to Facebook. They have solution formulas for pretty much any color of patina. If you choose to use them make sure to be careful. Rather then doing the threading, would you be able to just solder the pieces on? Or is that not strong enough to hold it? Very nice rose. I have been a blacksmith for 40 years and made many ornamental projects and it takes lots of practice to get good and it seems that you are cut out for this type of work. Keep at it and start more different projects. like making copper ladles and spoons. perhaps a copper pot or kettle. There is a huge market for hand made steelwork. It seems that people want the "old school" items more and more each day. You can pick up a small anvil or piece of railroad track and look into a leather peening bag ( round leather disc bag about 12" dia x 4" high filled with lead shot.) for your copper and brass peening. Keep up the good work you are a real artist. Good Luck. Robert. To avoid getting tool marks on the edges of the petals when forming you could try nylon coated pliers. They come in round nose and flat. I do love hearing that people actually make these - thank you so much! Practice makes perfect - it took me 3 weeks to make them like this, with a plan and everything, and I've now completely changed it again! Wow! This instructable was amazing! I was blown away by it's relatively easy process and my result was beautiful. Not to mention my girlfriends reaction when it was delivered to her at dinner! Great job mate will give it a try, for an anvil you could do what i have done get an old bashed one that does not have a flat surface mine was free because of this. Then layer up the surface will arc welding so roughly flatish then use a hand beltsander p26 or so and flaten then use bigger grits to get a shiney finish works a treat, good as new anvil. Hah, not a bad idea :) I've now changed up how I make these - plus, I've switched to making miniature ones out of silver instead :P But thanks for the ideas!